Dishwashers are not recent inventions. They’ve been around since the 1800s and they were modernized over time with the arrival of newer technologies. Most households in America now have dishwashers that clean dishes much faster and way more conveniently than human hands. However, an even greater convenience came with the development of the dishwasher pod. One might wonder how they’re made and how exactly are they used. Another question that could arise is whether dishwasher pods are better than regular dishwashing detergents. This article is all about decoding dishwasher pods, so read on to find out the answer! As the name suggests, these are small capsules which contain detergent for at least one cycle of dishwasher washing. This makes them far less messy compared to powders, liquids or gel versions of the detergents. Just pop them in the water and they’ll dissolve in a few seconds. The capsules are covered with a special film which dissolves in water as soon as it comes in contact with it. The film usually is made of PVA, which makes the pods soluble in water and stable with prolonged shelf life. With the film dissolved, the detergent is freed, giving an effective cleaning cycle. The detergent is concentrated since there’s less water inside the pod, which means more cleaning with less amount of detergent per cycle. This makes using dishwasher pods very cost effective. There are various dishwasher pods you might find on the market now. Some are regular while some come in special formats, such as eco-friendly pods or scent-free pods. You could get scented pods as well if you want your dishes to look good and smell good. Pods are preferred more than gels and detergent tabs or liquids because you don’t have to measure out anything. Just one pod is enough for one wash, which is comparatively better than the quality of cleanliness that comes from other alternatives. Despite the usefulness of dishwasher pods, you should still be extremely cautious when using them. These pods are somewhat poisonous as they often contain bleach, enzymes and other substances, not just detergent. Pods are only meant for cleaning and the ingredients shouldn’t come into contact with your skin. So, when using them, wear gloves and keep your hands dry because the film will dissolve as soon as it makes contact with your skin. If the pods do any harm to your skin, seek medical help immediately. Also, keep the detergent pods away from children. By following a few safety rules, you could even prevent lives from being lost. Remember those awful Tide pods that shocked everyone? More than 6000 children swallowed these pods in the USA and most of them ended up in hospitals. Some even died. So be careful and store them in a safe place. How to Choose and Store Detergent Pods? You would definitely want the best dishwasher pod available on the market. Choosing a good dishwasher pod is key to effective cleaning because if you pick a mediocre one, food residues may be left behind and you may have to use another pod for another cycle. Detergent pods are usually labeled with their cleaning power, so pick a product with higher cleaning power and concentration. This would ensure better cleaning per pod. You could choose pods with fragrances and scents, such as lemon or lavender, which might really depend on your preference. Choose ones that have no toxic ingredients or synthetic chemicals. Also, remember to check the package labels. You should definitely pick dishwasher pods that are eco-friendly. You could rinse your dishes before using the dishwasher first, then use the dishwasher to clean the dishes with an eco-friendly pod. This way, your environmental footprint would be reduced. Some detergent pods are biodegradable and can be recycled too. A package may be labeled as eco-friendly but you should still check out the ingredients before use. Lastly, it’s important that you store these pods in a dry environment, since they become activated when they come in contact with water. So, it’s best to keep them away from the sink. How about keeping them in shelves or seal them away in tight packets? This way, water vapor would not be able to get to the film surrounding the pods. Even on a humid day, the pods will remain safe. Now that you know everything about detergent pods – the good, the bad and even the ugly sides of them – it’s time for you to understand how to use them with caution and care. How to Use Detergent Pods? You have a sink full of dishes ready to get washed and cleaned. You first need to take a few precautionary steps before loading the dishwasher. Make sure that the dishes you’re about to clean are dishwasher-safe. Don’t use cast iron, plastic, copper, crystal dishes, insulated mugs or non-stick pans, as they could be ruined with heat. Usually, items that are not dishwasher friendly are labeled as such when you buy them. Don’t let the dishes sit for too long. One pod is enough for one load cycle. The main convenience of using dishwasher pods comes with the fact that each pod is individually packaged in such a way that usually only one of them is needed for one wash. If the dish load is a lot and extremely dirty, it’s best to add another pod. But try not to load your dishwasher more than what it can handle. 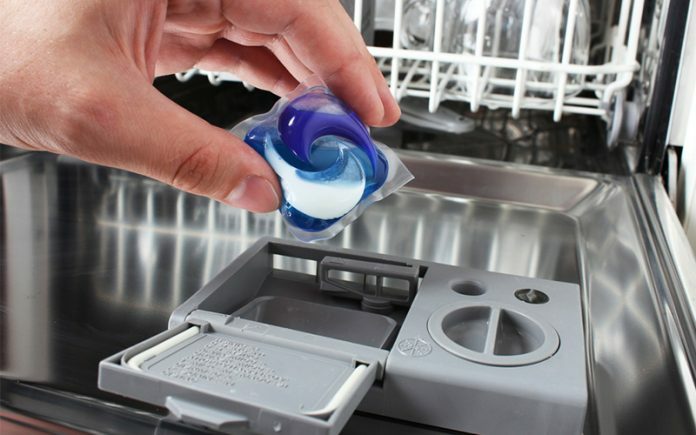 Insert a pod into a dishwasher detergent dispenser. You should place it in the right place, which is the inside of the dishwasher door. You can place detergent over there, or pods. Close the dispenser latch and then close the door to the dishwasher. While doing so, don’t pierce or open the pod for any reason. The contents could irritate your skin. For better results, use a finishing liquid with the pod. This definitely helps, as it clears away tough food particles and grease so your dishes would look shiny without any sharp streaks. Now fill the dispenser with the finishing liquid and the dishwasher would automatically use the right amount of the liquid on each cycle. Turn on the dishwasher and you’ll see how the pod does its tricks. Your dishwasher may have settings to control the temperature, so adjust it somewhere between 125 degrees F and 140 degrees F. This is the optimal range of temperature suitable for using dishwasher pods. Maintaining the dishwasher and cleaning it regularly is always important. Pods help to clean the dishes effectively without any doubt, but for effective cleaning that lasts for a long time, you have to make sure that your dishwasher is working. It’s better not to overload the dishwasher, and it’s also not a good idea to use it to wash only one or two items. If there are only a few dishes lying on the sink, you should wash it on your own. Only use dishwashers when there are a lot of dishes which you can’t handle on your own, especially if you’re in a rush. Dishwasher pods are affordable, compact and are more effective in one wash compared to tabs, soaps, liquids and detergents. However, they need to be carefully handled. Wet skin may get irritated if it comes into contact with pods. As mentioned before, there have been instances when people have swallowed pods and risked their lives. So despite their wide uses, you should store dishwasher pods safely and securely.